You can use Scheduler on a computer or mobile device. Scheduler is also connected to MyDegrees, allowing you to easily pull your active MyDegrees plan created with your advisor into your scheduling process. Favorite Schedules: When viewing a schedule, you can click the Heart icon at the top right of the screen to name and save favorite schedules. When registration opens, you can access all your saved schedules from the Favorites tab on the homepage to complete your enrollment! 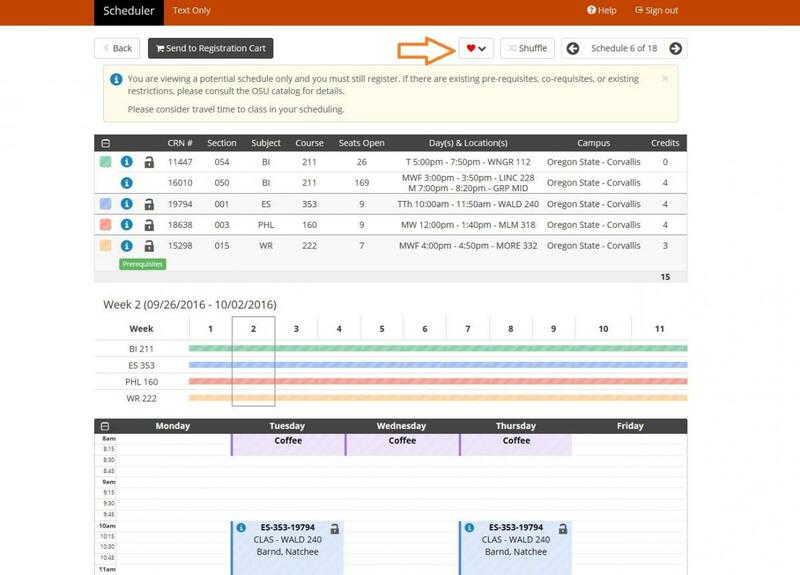 Class Padding: Class padding allows you to enter the time you might need between classes, making it easier to plan required travel time or breaks between classes. Click the Advanced Options tab to edit Class Padding. 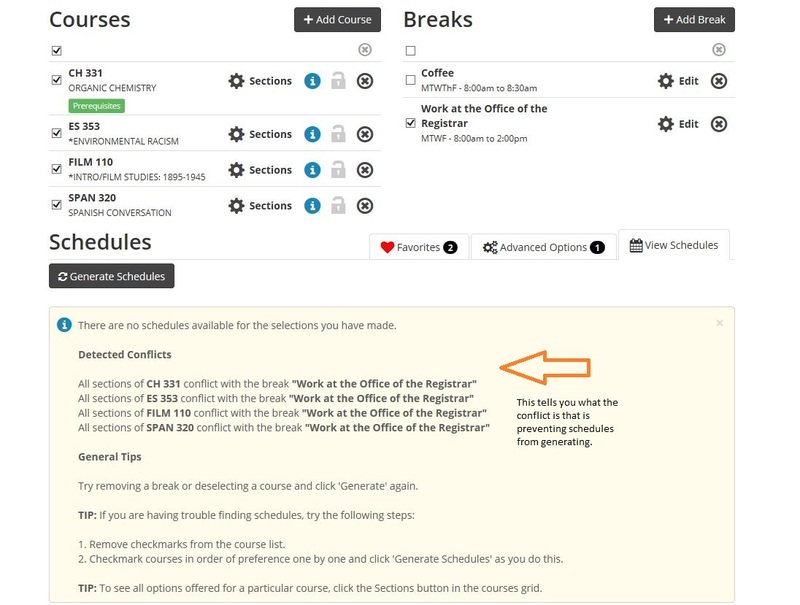 Conflict Detection: When no schedules are possible, Scheduler now audits your courses and breaks to determine which entries are conflicting. This will alert you of the conflict and provide tips to address it. Click here for informational videos on Scheduler. Click here for an informational hand-out. Where do I find Scheduler? What do I need to select when I get to Scheduler? Once I selected all classes for which I wanted to search sections, how do I generate a schedule? I see there is a MyDegrees tab in the Add Courses page. Does that mean I can use the classes in my MyDegrees Planner? I pulled in classes from the MyDegrees tab in Scheduler, but I am not done adding classes. How do I add a few more classes? I have selected too many classes to add and now I don't want all of these classes. If I want to start from scratch with no classes, how do I delete them all and not one-by-one? I created a schedule. Am I registered for classes now? How do I register now for the classes in my Scheduler? I see another link under Scheduler that says "Scheduler Registration Cart." What is that for? I wanted to create a schedule in Scheduler and was presented with a message that informs me that I already have a schedule in my registration cart. What do I do? I am looking for a seminar course such as HC 407 to add in Scheduler to create my schedule, but the course in not coming up in the search, why is this happening? When adding a Special Topics or Blanket course that has a specific title for each section, how do I make sure I am creating a schedule in Scheduler with the right section? Where in Scheduler can I see the section-specific title? 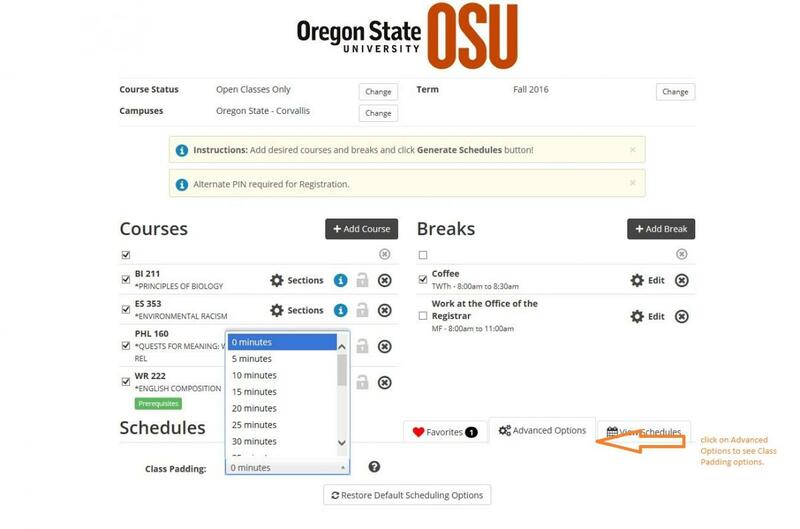 Scheduler can be found in the MyOSU Portal. Go to the Student menu and look for the Registration Tools. There you should find Scheduler. Click the link and it will redirect you to Scheduler. Select the term for which you would like to create the schedule, select the campus you attend, select the level of course you intend to attend (graduate, undergraduate), and then begin adding breaks and searching for courses. In the "Add Courses" page, click the "DONE" button to get back to the page to generate a schedule. On the bottom of the page, click "Generate Schedule." Yes! If you or your advisor have set up a plan for the term you're creating a schedule, you can pull them over from MyDegrees to your search and search for available sections of these courses. Just click on the "By Subject" tab. Now you can continue adding additional classes to your list. Check the square box to select all courses and click the X button to delete them all. No, creating a schedule is part of the registration process, but not the end. You still need to send this schedule to Online Services and submit your CRNs to register. Select the schedule that best fits your needs, click on the "View" link. On the top of the page, click "Send to Registration Cart" button to send the schedule to Online Services. You will be presented with a message that you will be redirected to "Registration Cart," which is in Online Services. Hit "OK" and Scheduler will close and send your information back to Online Services. In Online Services, you will be presented with your selection one more time before finalizing your decision to register for the classes selected. Click the "Register" button to register for classes. Scheduler Registration Cart stores the schedule you sent from Scheduler. The classes will stay in the "cart" until you actually register for them. You can also clear your cart here. You can choose to "Go Back to Registration" and clear your cart. Alternatively, you can register for classes you sent to your cart or ignore the classes in your cart and "Continue Planning Schedule." Some courses are marked as closed and open for registration closer to the start of the term for scheduling reasons. Make sure you set your Scheduler filter for “Open and Full” classes so these classes will be displayed. You can still generate a schedule with closed classes but you will not be able to register until the course is opened for registration. When you find the course, add it to your list to generate the schedule. When your list of classes is ready to schedule, click on the “gear” icon next to Sections. It will give you all available sections for this course. You will be able to see the section-specific title by clicking on the round information icon.